WASHINGTON — As Congress moves ahead on efforts to reshape federal policy, more Alaskans than ever are itching to let their lawmakers know what they think about it. Phones in Washington, D.C., offices have been ringing at unprecedented rates, and mailboxes are clogged with postcards. And nationally, voters unhappy with President Donald Trump's first month and Republicans' intentions of repealing the Affordable Care Act have been demanding "town hall" events with lawmakers. That includes Alaska, even with its longtime Republican leanings. Alaska Sen. Lisa Murkowski, a high-ranking member of the GOP with known "moderate" tendencies, has faced heavy lobbying from Alaskans, and jammed phone lines. 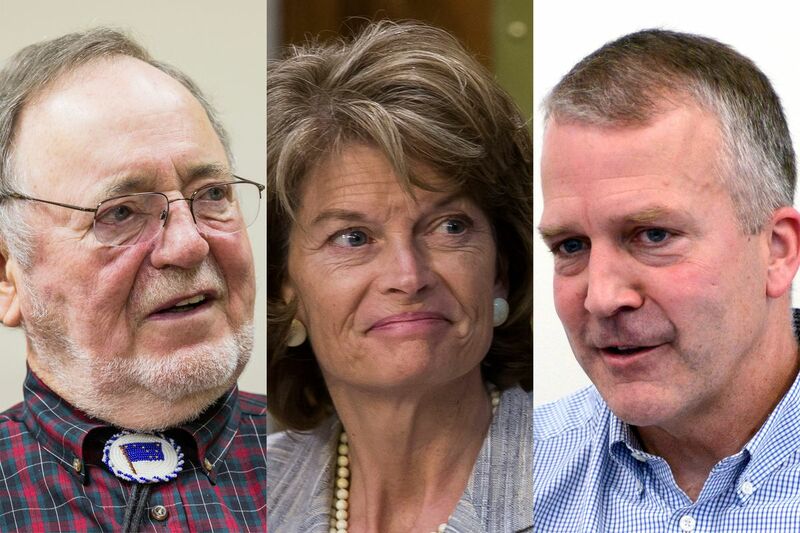 Alaska Sen. Dan Sullivan and Rep. Don Young, who each trend further to the right in their political beliefs, have faced similar, but less intense citizen lobbying over the last month. All three lawmakers will be working in Alaska this week, as Congress takes its traditional recess during the week of President George Washington's birthday. None of the three plan to hold town hall events — an open meeting where a lawmaker takes questions (and occasional verbal abuse) from constituents. While all three do have regular meetings with constituents, none of the three generally uses this format, and they don't seem interested in starting now. The "town hall" movement is part a nationwide push by liberal groups using the same playbook, distributed by advocacy group Indivisible. Indivisible and MoveOn.org, via ResistanceRecess.com, are organizing local events and pushing lawmakers to hold town hall events, where constituents can confront their lawmakers on camera. They urge protesters to put it on Facebook Live, call the press and keep pushing lawmakers in public ways. More than 800 Alaskans signed on to a petition urging Alaska lawmakers to hold town halls, and thousands more have signed on to activist groups online. In an interview Thursday, Young said of town halls: he "never believed in them," and that the format doesn't lend itself to civil conversations about policy. "I do meetings with local groups that ask me," he said. Young noted that he planned to attend an Eagle Scouts celebration this week. The congressman "has chosen to use his limited time in state to conduct issue- and policy-focused meetings requested by constituents and organizations," said Young's spokesman, Matt Shuckerow. He also encouraged Alaskans to use the congressman's website to contact the office, and to call or reach out via email. Staff are also available to meet with Alaskans in the state, and "assist with specific cases between individuals and our federal agencies, and provide updates on policy issues currently before the Alaskan people. Additionally, in the growing age of digital media, Alaskans are encouraged to connect with Congressman Young via social media, including Facebook and Twitter." While getting face time with the congressional delegation isn't an impossible prospect, it never hurts to formally register your opinion, by phone, mail or email. After tens of thousands of callers crippled Murkowski's phone system in Washington during the confirmation process for Education Secretary Betsy DeVos, the senator revamped her phone system. Now, callers are given three options — more information about office hours, for Alaskans to leave a message expecting a response, and to speak to a staff member. Sullivan and Young's offices have a single-entry phone system in their Washington, D.C., offices, meaning that when you call the office, either someone answers at the front desk or you get a voicemail. On Monday, a federal holiday, Young's voice mailbox was full. To register a position on something, such as a confirmation vote on a cabinet nominee or upcoming legislation, it's often easiest to call or email, either a local office or in Washington, D.C. The offices log calls and positions on issues. If your concerns go beyond registering support or opposition for an issue, then be sure to try and either talk to a staffer or email the delegations' offices. When calling Murkowski's office, choose option No. 2, for Alaskans who want a response, and leave all your information so that someone can call back. If you have a particular problem that needs solving, it never hurts to be specific and tell a story. Having a general position on an issue is one thing, but it can be helpful to say that X federal policy has affected you in some clear way. And sometimes, staffers or lawmakers can offer some help. You can also request a meeting. If you're an Alaskan in Washington, D.C., you have a pretty good chance of getting some face-to-face time with a member of the delegation. It helps to call ahead, but all three try to make time with any Alaskan who has made the long trip eastward. Don't leave local offices out of the mix: You don't have to go to Washington, D.C., to find staffers connected to your senators and congressman. Murkowski and Sullivan have offices in Anchorage, Fairbanks, Juneau, the Mat-Su area, Kenai and Ketchikan. Young has offices in Anchorage and Fairbanks. All three members of the delegation have a form on their website for Alaskans to fill out and try and schedule a meeting: Murkowski, Sullivan, Young. Some have issue-specific staff directories online too. It doesn't hurt to gather a group of people that wants to discuss a particular issue of concern (health care, for instance). Gathering a local group can be an effective way to get an audience with a congressman or senator. If you really have something to say, you can always make yourself known by finding your representative and telling them what you think. The U.S. House and Senate both have a "state work period" this week. And there are breaks throughout the year. The delegation will be back in Alaska for two weeks in April, for a week over Memorial Day and Independence Day, and then for the full month of August. The exact dates are available here (Senate) and here (House). Members of the Alaska delegation are usually available at major events, such as the start line of the Iditarod, the annual convention of the Alaska Federation of Natives and state fairs. None of the delegations' offices offered specific schedules or a list of public events upon request. But there are a few public events worth noting. According to a spokeswoman, Murkowski will be in Anchorage and Ketchikan over the course of the week, meeting with constituents and members of the press. During this week, Sullivan plans to visit "four towns in six days: Juneau — where he will be addressing a joint session of the Alaska Legislature — Fairbanks, Petersburg and Anchorage," said his spokesman Mike Anderson. He also suggested getting in touch by "writing, emailing or calling one of our seven offices throughout Alaska and D.C., in addition to following our social media accounts." Sullivan spent the weekend at the Munich Security Conference with 15 other lawmakers, on a trip led by Sen. John McCain, R-Arizona. "Since elected, Congressman Young has always opened his doors to all Alaskans visiting Washington, D.C., and continues to work diligently throughout the congressional calendar to meet with Alaska constituents and groups — on both sides of the aisle — throughout his travels in state," according to Young's spokesman, Shuckerow. This week, Young "is scheduled to take part in a number of constituent meetings and events, including those organized by public organizations and groups, in the Southcentral area — primarily Anchorage." So where exactly to find them? Both Murkowski and Sullivan will address the state Legislature on Wednesday and Friday, respectively, in Juneau. A group of sign-wavers plans to greet Sullivan at the state capital on Friday at noon. On Wednesday at 4:30 p.m., Sullivan will speak at the Alaska Chamber of Commerce to an invited crowd of business people discussing the Affordable Care Act. Another group of Alaskans plans to rally outside in support of the law. On Thursday, Feb. 23 at 5:30 p.m., Young is holding a fundraising event at the Petroleum Club of Anchorage where, according to a mailer, he plans to speak about the president's first 34 days in office. On Friday, Sullivan will be at the Capital City Republicans Lincoln Day Dinner, but the $100-per-person fundraiser isn't much of an option for discussing the finer points of policy or getting your viewpoint heard. Trouble getting in touch with your lawmakers? Have a success story to tell? Maybe you don't have time to loiter in a hallway for two hours just to ask a senator one question that's been nagging at you. Your adn.com D.C. reporter does! (OK, sometimes.) Email with questions, ideas and concerns: emartinson@alaskadispatch.com. UPDATE: Upon request, here are a few more links for contacting and following your congressional delegation. CORRECTION: This story was updated to reflect the correct start time for Sen. Dan Sullivan's round-table event with the Anchorage Chamber of Commerce. The meeting begins at 4:30 p.m., not 4 p.m.